Elasticsearch is a fast and scalable search engine technology. Its power and simplicity makes it popular with organizations that need to index and search very large volumes of data. At Cambridge Intelligence, we help many developers empower their users with visual tools to explore their Elasticsearch data. We do that with KeyLines – our graph visualization toolkit. Speed – KeyLines is a fast and powerful graph visualization engine. That performance is amplified when paired with Elasticsearch. Easy integration – Elasticsearch includes a powerful REST API, meaning integration with KeyLines is fast and simple. Flexibility – Your KeyLines app is fully customizable – from the user interface, to the workflow and the functionality. 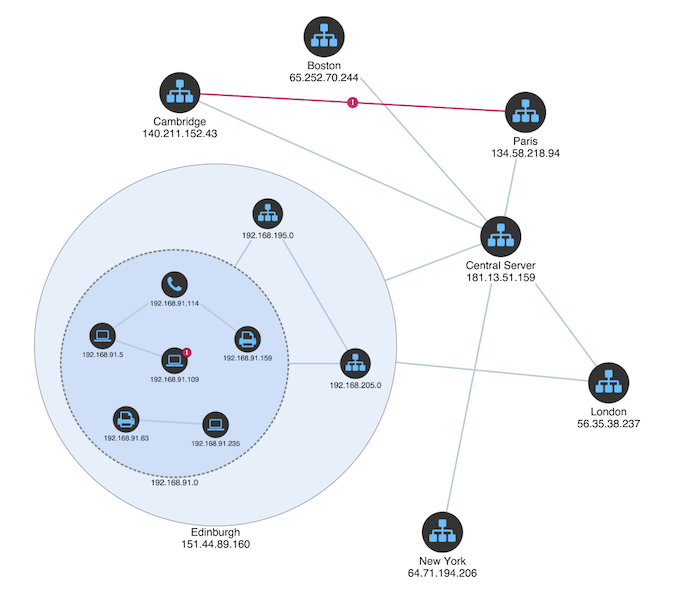 The interactive KeyLines interface enables users to explore the connections in their Elasticsearch data quickly and effectively. Every aspect of your KeyLines application can be customized. With an interactive KeyLines interface, users can ‘walk the graph’, exploring graphs quickly and effectively. The best way to unleash the power of Elasticsearch is to visualize it. The ‘node-link’ model is simple and intuitive. Combined with the brain’s unrivalled pattern-spotting ability, it’s a great way to visualize, explore and understand graph data. Visualization applications built with KeyLines have powerful graph visualization and analysis functionality, can be easily deployed (as web applications) to unlimited users worldwide and can be 100% customized to your needs.